Here is a great quote from George Lois about collaboration that Paula Scher had featured in her book, Make It Bigger. It's funny how you end up running into situations either at work or some wine tasting party or something where people start falling into these categories. "There are smart people and dumb people. There are people who have energy and people who are lazy. They exist in combinations. If you work with a smart person with energy, that's your best collaborator. 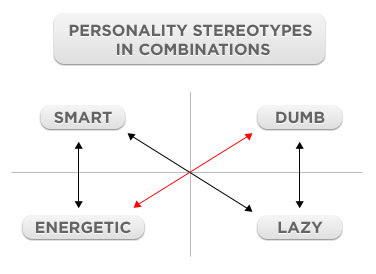 If you work with a smart person that's lazy, well, that's a bit of a waste, but it does no harm. If you work with a dumb person who's lazy, that's sad but not problematic, because they will simply be ineffectual. But if you work with a dumb person with energy, therein lies the seed of disaster."